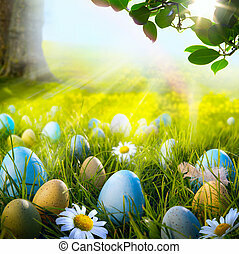 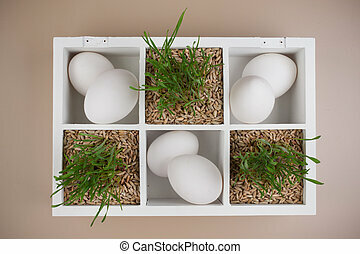 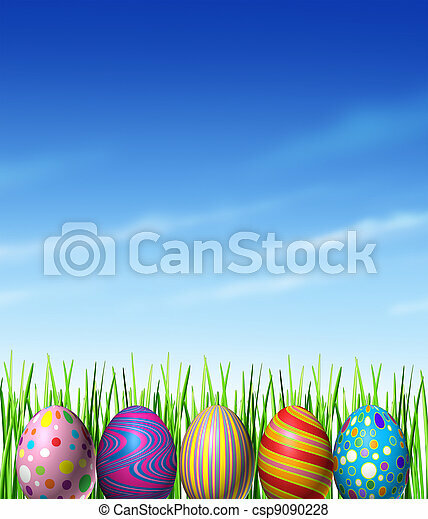 Easter spring decoration with decorated traditionally painted eggs as a cultural and religious celebration of renewal and hope as a symbol of an egg hunt game for kids with grass and a blue sky design element. 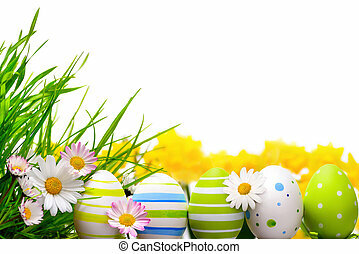 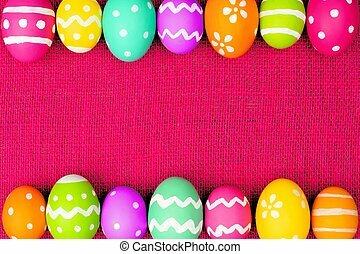 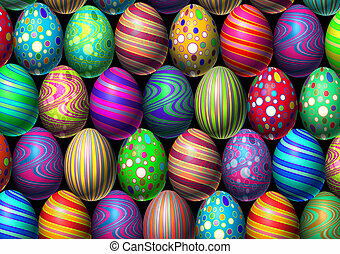 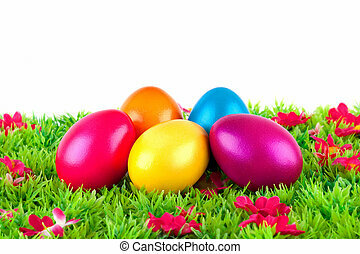 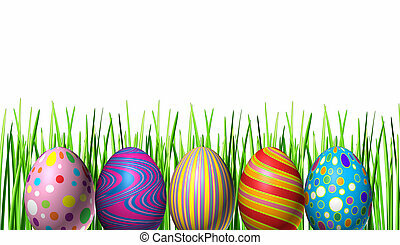 Easter holiday eggs decoration with five multi colored festive spring ovals in a row in celebration of a religious and traditional cultural event representing renewal; and an egg hunt for kids fun on a white background with grass. 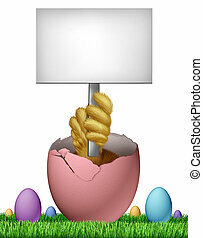 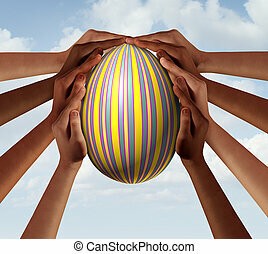 Easter people coming together as a group of diverse community members holding a decorated spring holiday egg in a traditional celebration with 3D illustration elements. 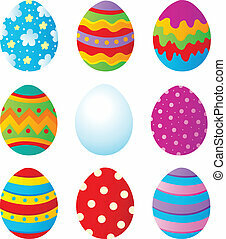 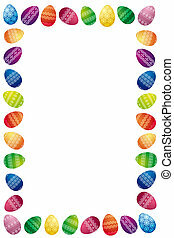 Easter egg background holiday eggs decoration with multi colored festive spring ovals in a celebration of traditional cultural easter egg hunt. 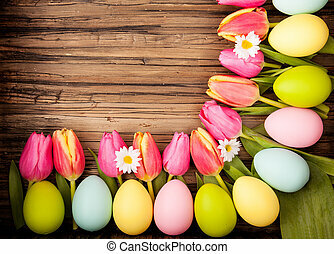 Easter surprise holiday concept as a cracked white egg with open shells and a magical yolk emerging as a decorated ornamental design as a symbol of inner beauty and spring season celebration. 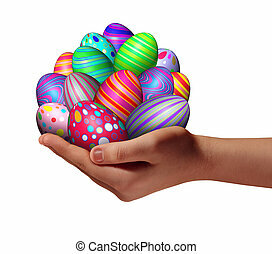 Easter egg success as a spring time holiday celebration concept with a human hand holding a group of decorated ornamental eggs found in a traditional easter hunt isolated on a white background. 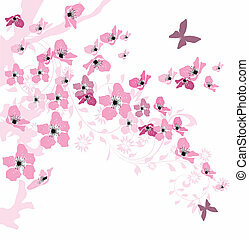 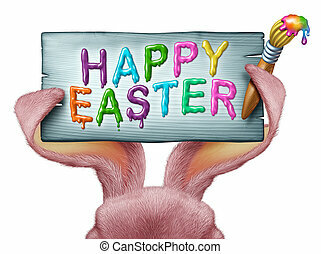 Happy Easter painted on a wood sign with a paint brush and being held by pink rabbit ears with detailed textured realistic fur as a fun spring symbol of holiday celebration isolated on a white background. 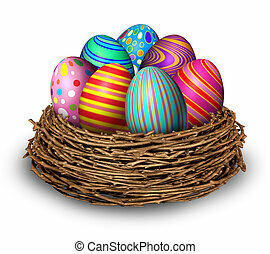 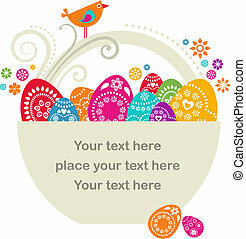 Easter eggs nest holiday symbol decoration with seven multi colored festive spring ovals in a bird nest for celebration of a religious and traditional cultural event and an egg hunt on a white background. 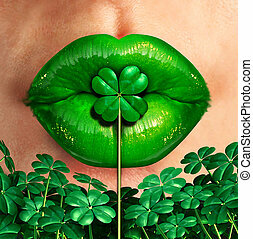 Spring kiss as emerald green lips kissing a four leaf shamrock clover as a st.patrick's day good luck charm celebration symbol. 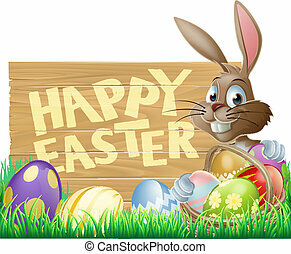 Easter bunny with white fur juggling decorated festive eggs using his big rabbit ears with a blank white area as a seasonal symbol of spring fun and celebration. 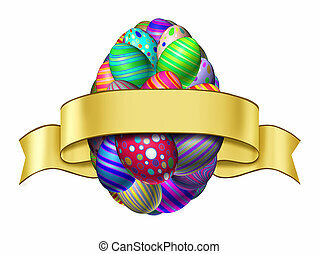 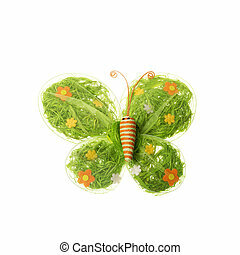 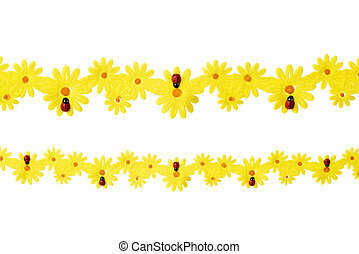 Easter ribbon label concept as a happy spring celebration blank banner with a group of colorful decorated eggs shaped as a giant egg isolated on a white background. 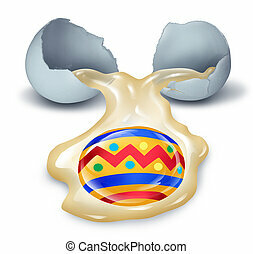 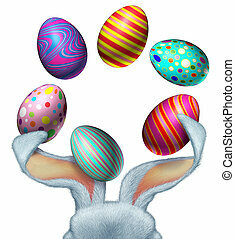 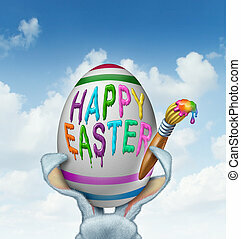 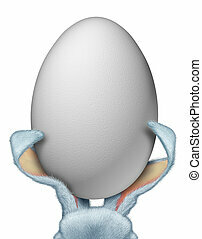 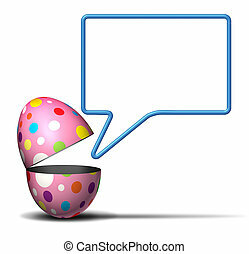 Easter Bunny with white rabbit ears holding a giant blank white egg as a fun spring symbol of holiday celebration event as an advertising message on a white background. 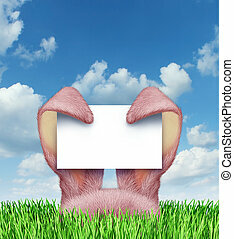 Easter bunny sign with pink rabbit ears holding a blank sign card on a spring blue sky popping up from green grass as a symbol of a fun holiday celebration advertising message. 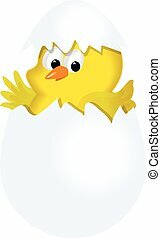 Easter blank sign card with a baby chick emerging out of a cracked pink egg with a wing holding a white card banner as a fun spring symbol of holiday celebration and as an advertising marketing message.